This article discusses various features that are essential for your eCommerce store’s search engine. If your store search experience is bad, your customer might hop to the next available site to make that purchase. 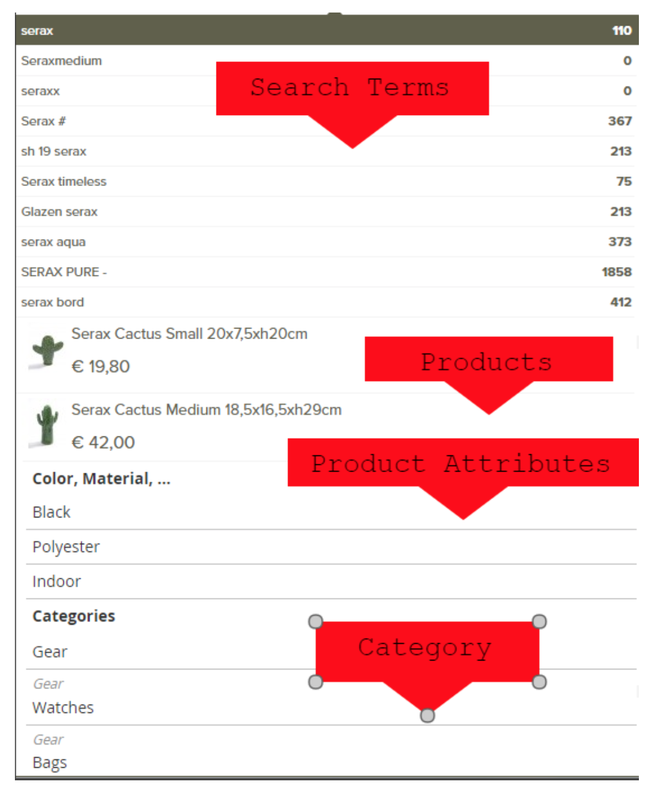 Category listing page or catalogue listing page: A list of products segregated based on category with filters/facets typically on the left side. Search result page: This is similar to a category listing page. The only difference is that the list of products may come from different categories. Customer: One who is visiting the site to make a purchase from your ecommerce store. 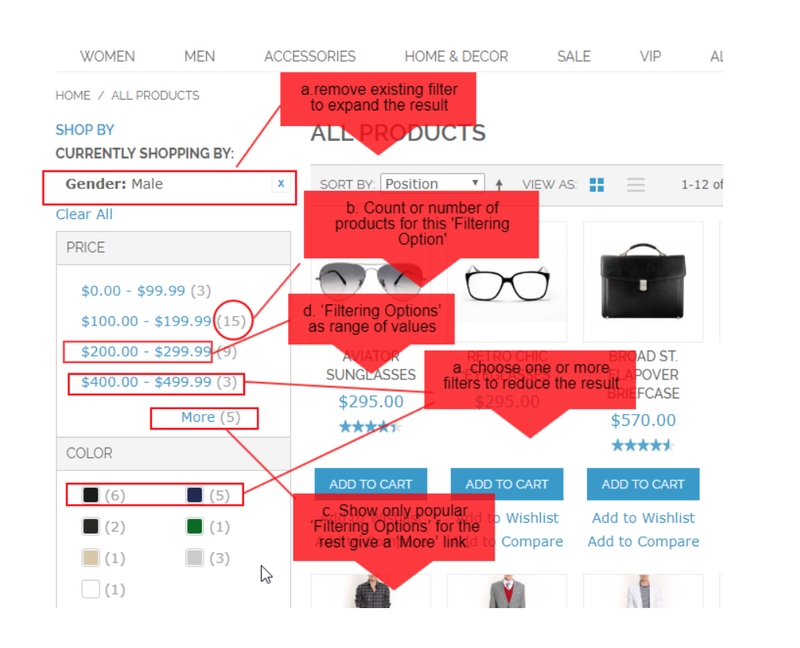 Filter/facet: These are the options usually displayed on the left, up top, to narrow down product listings. Admin: You or your store eCommerce manager. Breadcrumb navigation helps users get back to the previous category or page. This is normally available in ecommerce or CMS applications. Facets give users the ability to iteratively refine or expand their search results and ultimately helps the user to browse the list of products which he intended to quickly. This filtering is now usually done via Ajax or using Single Page Applications to make the results load faster. Show only popular filtering options â€” for the rest, provide a 'More' link. These facets/filters are product attributes and they should be configurable, meaning a product attribute should have config settings to make it searchable and to show as facet or filter in the catalogue list view. Users should be able to sort the search results. For example, sort Price (Low to High) helps the user find products in the budget range they’re looking for. Made popular by Google’s search engine, this helps the user to choose the product based on a few letters entered. This helps customers search products with keyword or partial key terms, or some other attribute of the product. Typically, this is one of the most used features that customers use to search for products. Search terms: These are the terms that were already searched by other users on your sites. These can be created by store admins, and if necessary synonyms can be added to search terms. See the next picture. Attributes of the products, such as color or size. If there is no result, or too few results, we can correct the user by using 'Did you mean' or auto-correct functionality. What Technical Products Are Best for Search Engines? A regular database (MySQL, PostgresQL, MongoDB). Sphinx: Sphinx is a full text search engine that provides text search functionality to client applications. Apache SOLR: Open-sourced by Apache, SOLR is a merged effort of the former SOLR and Lucene. This is also one of amongst the popular option available. ElasticSearch: ElasticSearch is currently the number one leader in the search market. This product is also open source, and also a fork of Lucene. Plugins are typically available for major ecommerce platforms such as Magento and OpenCart. Amazon ES service: Amazon AWS’s provided service for ElasticSearch. Amazon CloudSearch: An Amazon AWS product, can be used as a solution for your eCommerce search engine.